Advance apologies for starting the New Year on a down note, however the topic of boxwood blight has been on my mind since fall. I am still somewhat in denial, hoping the problem will go away if I don’t talk or write about it. Sadly though, my magical thinking isn’t working. Like other uncomfortable reality checks, especially those connected to the roller-coaster of climate disturbance, boxwood blight is here for the foreseeable future. Boxwood blight is a fungal disease spread by spores carried via air and wind. High temperatures, humidity, overhead watering and rain create ideal vectors for the spread of blight. This year’s unprecedented rainfall and high humidity created the perfect combination for rapid spread of the disease. 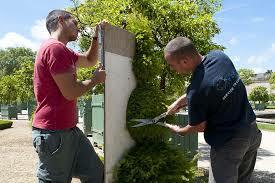 Once a plant is infected, the disease spreads very quickly, easily defoliating entire hedges within days. The damage can be sudden and dramatic, and once diagnosed, there is no treatment or cure. Affected plants have to be carefully removed along with all associated leaf debris. The debris cannot be composted and must be kept separate from other plant material. Tools used to remove affected plants must be disinfected in order not to further spread the disease. Even shoes, clothing, birds and other small animals can carry blight from one garden to the next! Making matters worse, soil hosts the fungal spores for up to 6 years, making replanting of new boxwood in the same location ill-advised. 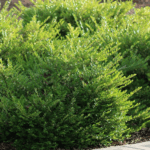 Even with removal of soil, introducing boxwoods again to the same plant bed is highly risky, although some cultivars are considered more resistant than others. Blight was first identified in England in the mid 90’s but didn’t reach the US until 2011 when cases were reported in Connecticut and North Carolina. It moved on to Delaware, Virginia, Pennsylvania and a handful of other states, with the earliest cases confirmed in New Jersey in 2013. Although aware of box blight traveling ever closer, I still hoped our gardens would be spared. This summer, however, over a dozen cases were confirmed in the Montclair/Glen Ridge area and reality set in. Boxwood blight appears first as light brown spots on the leaves. Spots enlarge, often with concentric circles, until entire leaves are affected and then drop completely off the plant. The fungus also infects the wood resulting in dark brown to black “diamond-shaped” lesions and stem dieback. The disease spreads very rapidly with plants fully defoliating in a short period of time. It’s important to have professional diagnosis and confirmation. 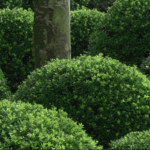 Boxwoods are affected by other diseases which may cause similar looking damage. 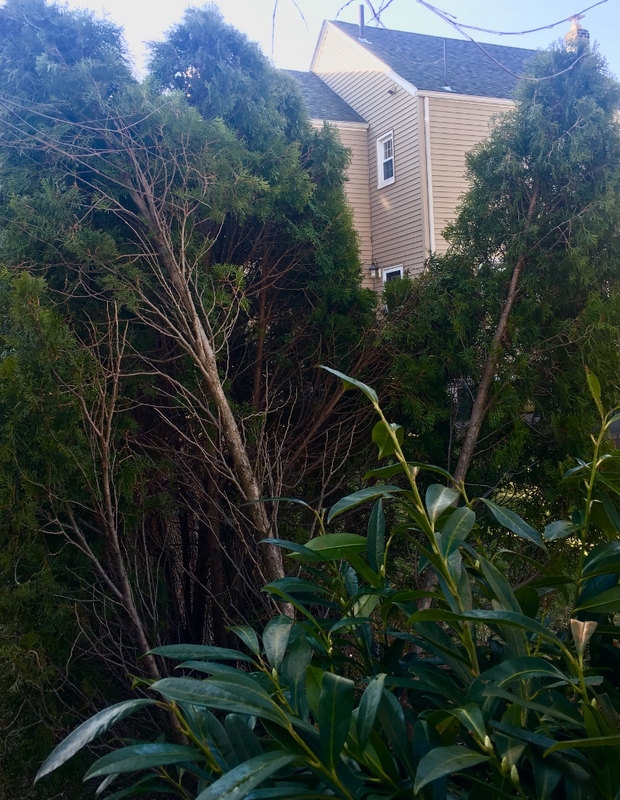 Beyond the damage and loss to properties of old and new boxwoods, two main questions arise: how to manage or prevent the spread of blight and what to substitute if boxwoods have to go away? Prevention seems to be the best and only method for management right now with fungicide treatments sprayed throughout the growing season. Just as boosting the immune system staves off illness, the same is true for the plants. Spray treatments have to be applied to the full plant (all leaves and stems) and rainy weather will increase the frequency of treatments required. I recommend having your current landscape inspected by a trained specialist and following his or her recommended protocol for plant protection. Further, monitor overhead irrigation keeping it to a minimum especially during periods of high humidity or after heavy rainfalls. 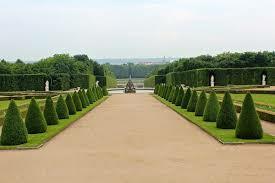 Consider planting boxwoods farther apart to promote air circulation and to slow disease spread. 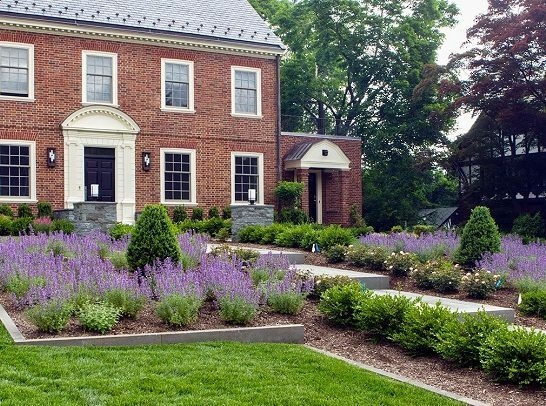 It’s not an overstatement to say that boxwoods are the backbone of the landscape industry and that there is no real substitute. As a broad-leafed evergreen they create architectural structure, are winter hardy, deer resistant and even tolerate a good amount of shade. 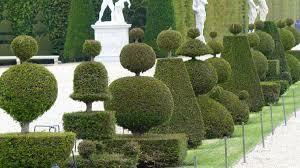 They are indisputably beautiful for hedging and take well to shaping and pruning. If boxwoods are now ‘high risk’ investments, what can be substituted? 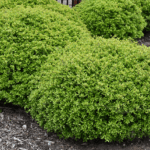 No other shrub possesses as full a range of benefits as the boxwood, so here’s hoping that the industry quickly will be able to both treat diseased plants and develop truly disease resistant cultivars. I still plan to use them, but more sparingly and with client consent that risk is involved. I can’t go cold turkey on one of my favorites, and remain eternally optimistic that the industry will eventually find us a way out of this dilemma. The Suburban Lot is a monthly blog that highlights topics and issues unique to the suburban landscape. For assistance with any of the above information please contact Mierop Design, a complete resource for landscape design, installation, outdoor furnishings and property maintenance services. SO REALLY, WHAT’S THE RUSH? In 2018 I have traveled to two dramatically hot, dry and ancient places. India came first in late winter, followed by Arizona this month. 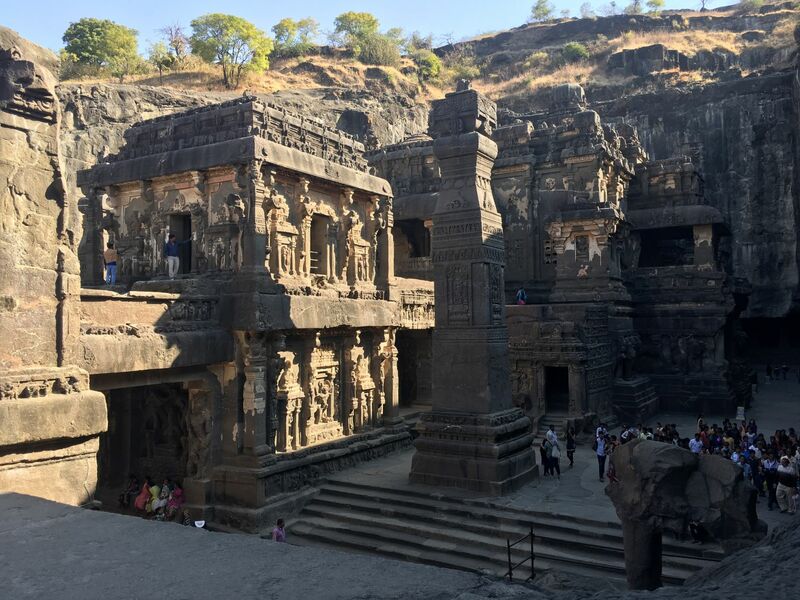 Both trips involved extended driving through vast expanses of mountainous desert land peppered by stops at archaeological and man-made monuments. 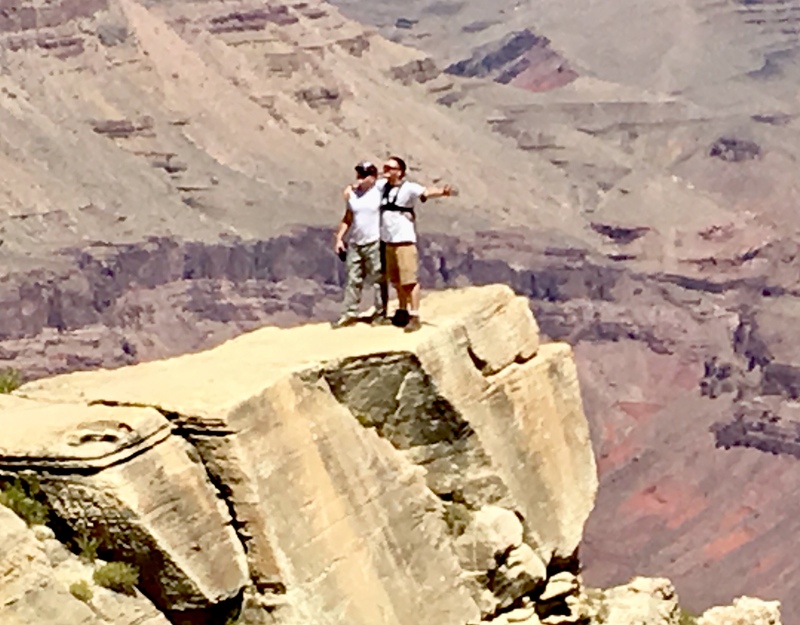 These visits to vastness: the Grand Canyon stretching hundreds of miles and Buddhist monasteries that took generations of laborers to carve into mountains before the birth of Christ, offer sharp glimpses into what infinity looks like. 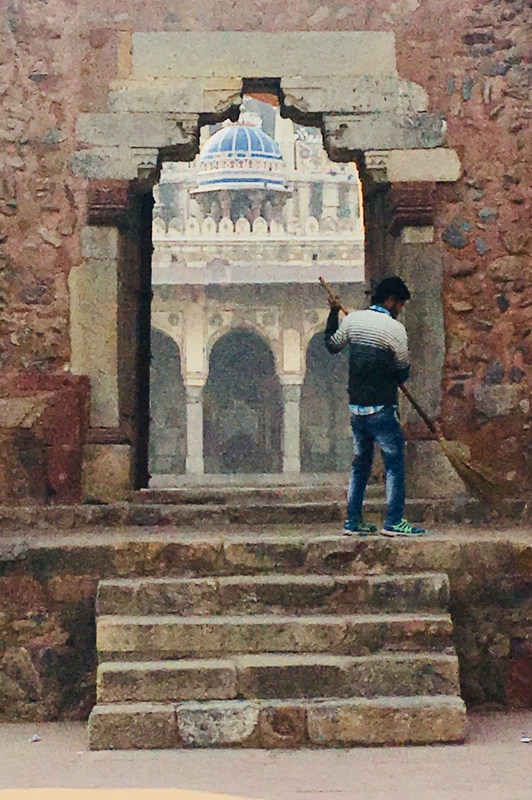 One can’t fail to be humbled by the monumentality and timelessness of it all, while simultaneously reminded of the fleeting nature of individual human life. I am a designer. What does all this have to do with me or the business of imagining and implementing landscapes for a paying clientele? The answer is: everything. 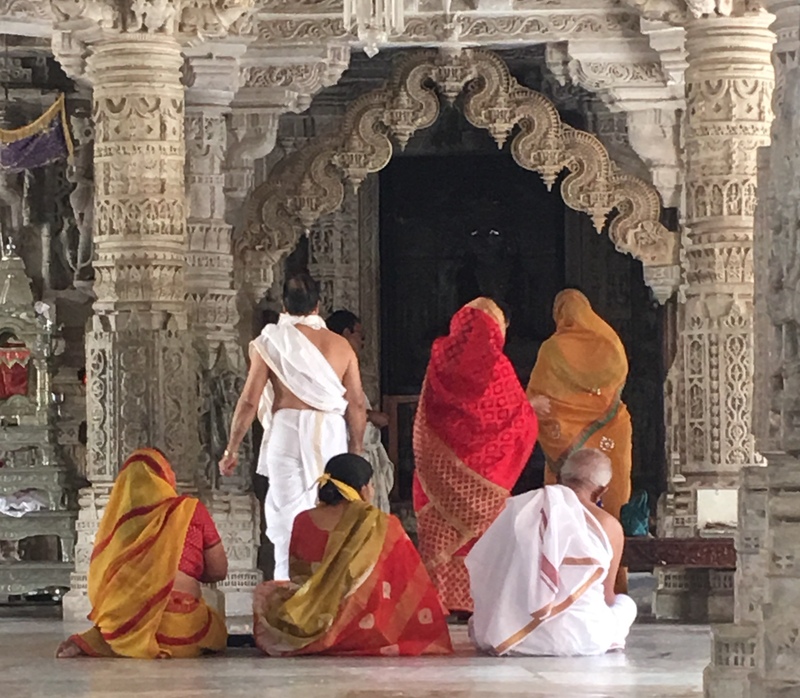 Trips like this can’t fail to push ‘pause’, opening up renewed annoyance with the inane electronic life we live: cell phones, laptops, Amazon-everything and the ever-present rush to do more ‘better, faster, smarter’. Baseball, the beloved American multi-billion-dollar sport, is in serious jeopardy of losing popularity because its audience is ageing and the game doesn’t move fast enough for younger fans. 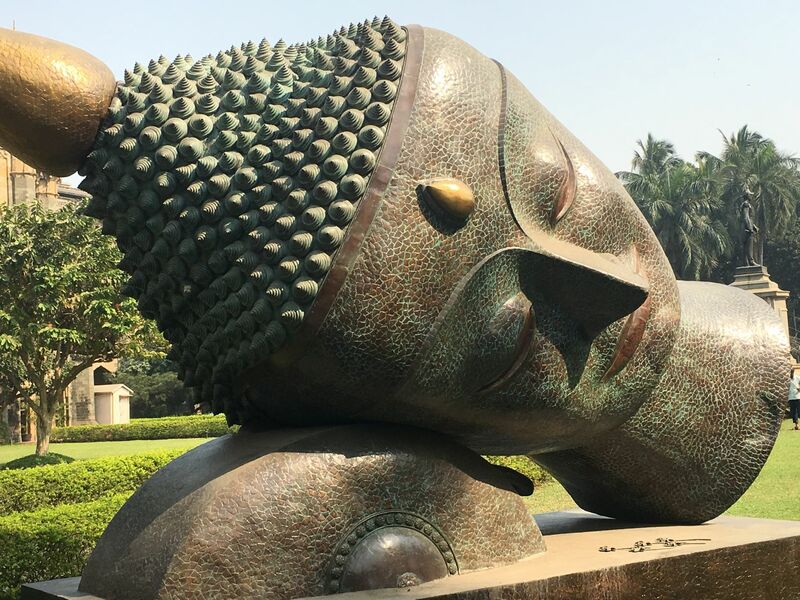 Time Magazine reports that “there is a major dissonance between the focus and attention it (baseball) demands and the habits of younger generations who expect action to be a click away.” Yikes, try telling that to Buddha!! I immediately translate this dilemma to my business as I more often encounter expectations about timelines and outcomes that are so accelerated from ten, or even five years ago. ‘Point and click’ may work for shoes and airfare, but it will never, and should never be asked to work for landscape design and implementation. 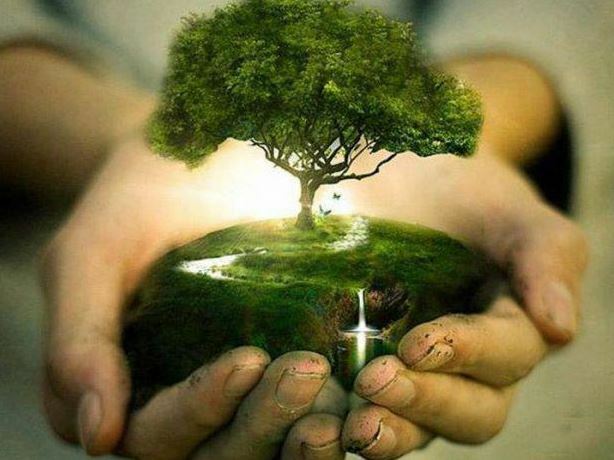 People used to plant trees for their grandchildren. Now they plant them for a party scheduled a few weeks away. I have clients request the biggest possible plants because they “don’t want to be old” before enjoying them, or they ask why building a hand tooled stone wall has to take ‘so long’. The requests and questions leave me completely baffled. It’s takes time – that’s mostly the point. Landscape is not an off-the-shelf purchase. It’s very much about the time spent waiting, watching and experiencing the unfolding, liquid process of life. 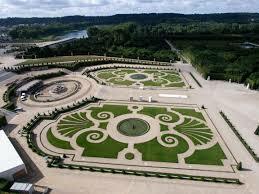 You wouldn’t expect your children to arrive as fully formed adults, and it’s the same with landscape. 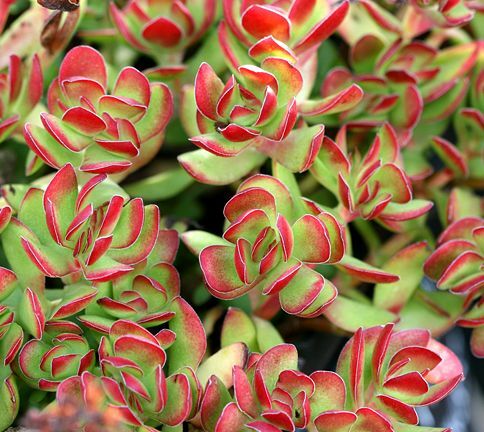 The place where you buy plants is called a ‘nursery’ for good reason. Watching change and growth, failures and successes is the joy of having outdoor rooms. There is no need to ‘hack’ (I loathe this word) any part of it, looking for quickie short cuts. 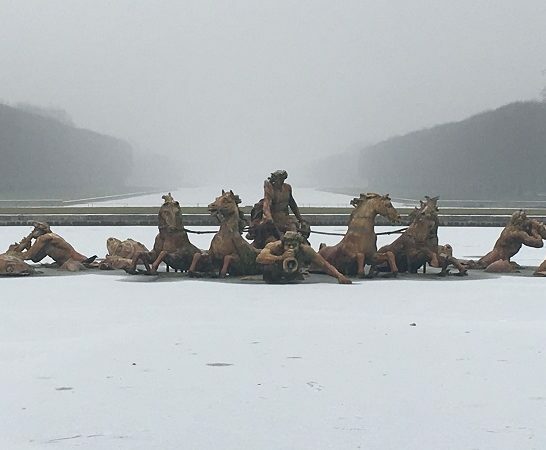 Hacking doesn’t apply to Mother Nature. She’s in no rush. 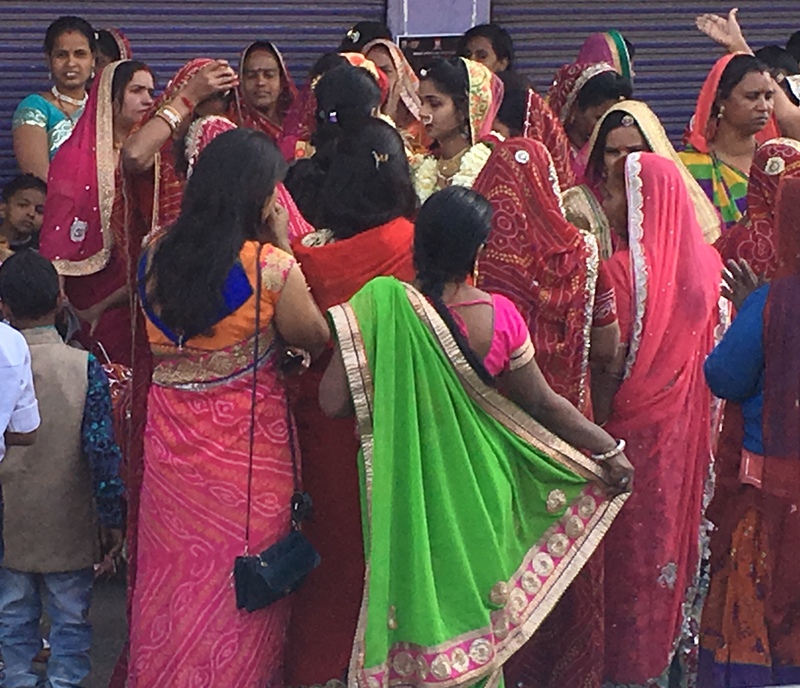 India and Arizona rewired my thinking, leaving an expanded sense of space and time, a sharp contrast to my work pace. I’m going to modify that and take a longer view. I’m going to get back to the garden! This blog has been very quiet for a long while. Winter left much weather damage in its wake, and spring brought rains that seemed never to stop! The season finally feels off to a very late start – with replacements to damaged trees and shrubs almost behind us. The early months of the year were a boon for press for Mierop Design. Many thanks to interior design firm, House of Funk, for their series on local women who own their own businesses. 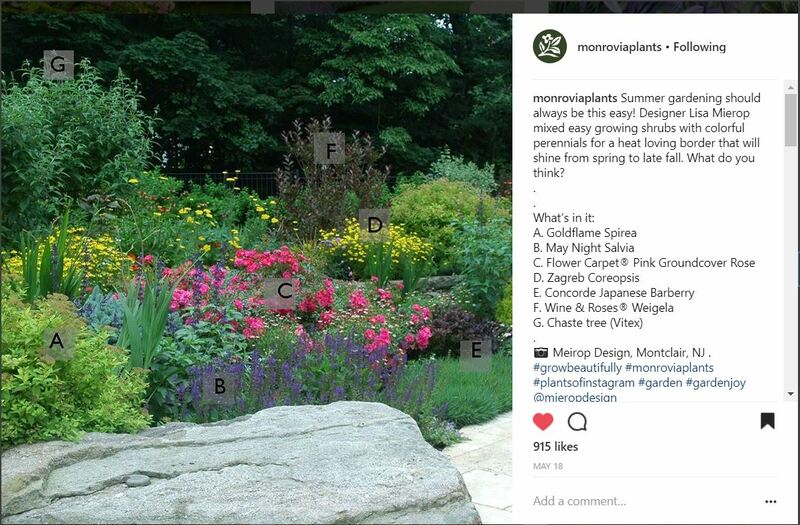 I am very grateful for their blog about me, which is re-posted here….and to Monrovia Growers (a most favorite resource for great plant materials) and Houzz (an on-line community for design professionals) for their mentions and awards. 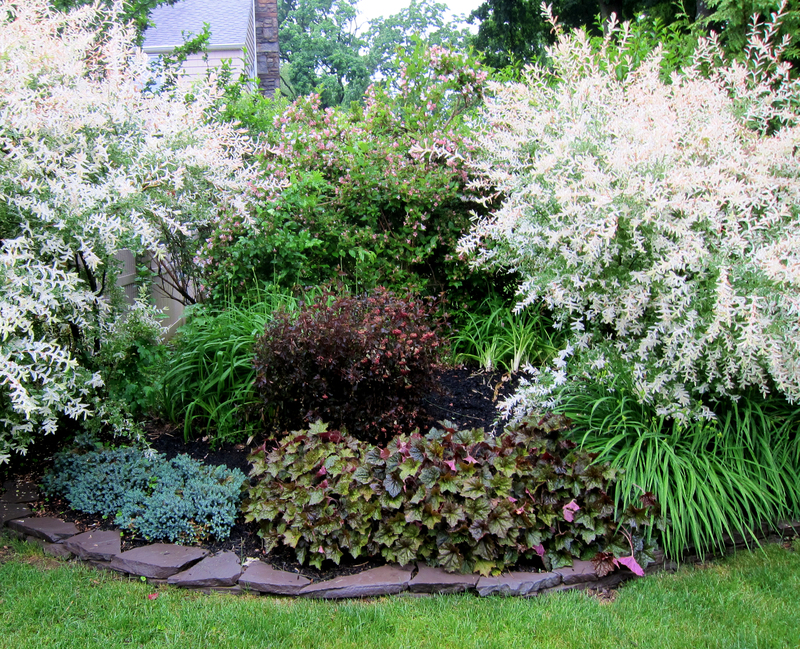 For landscape designer Lisa Mierop, a garden has to work in all seasons. Mierop’s takes into account the form and function of both the home and landscape, as well as the homeowners’ aesthetic and needs. 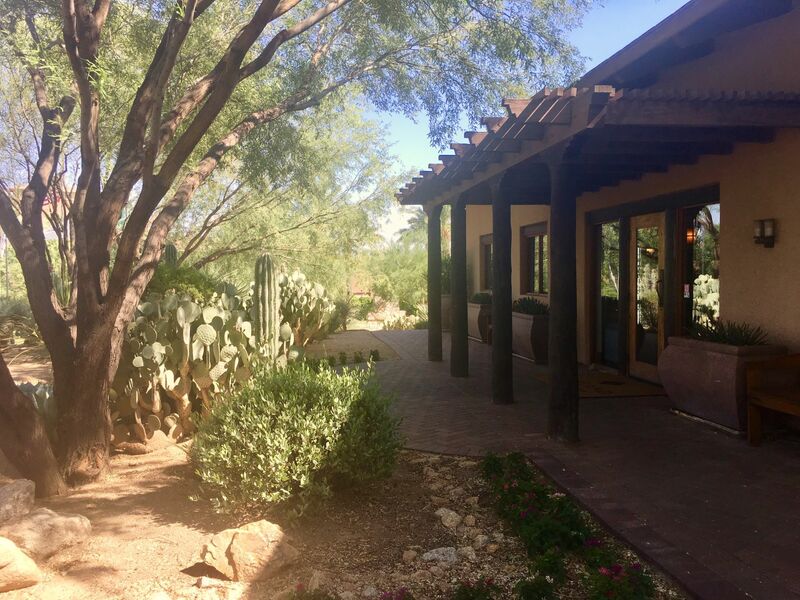 The result: Gorgeous landscapes that bring daily joy to its inhabitants and increase a home’s resale value tenfold. 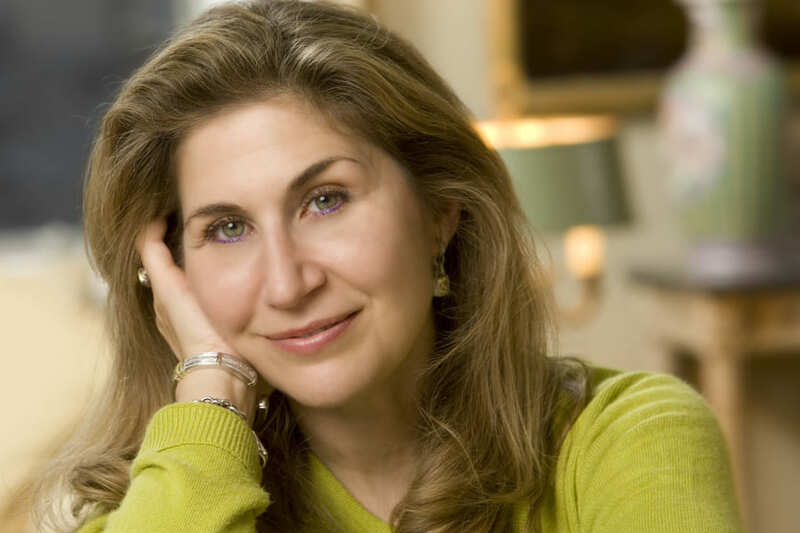 Mierop has taught classes for The New York Botanical Garden, The Montclair Garden Club, and Van Vleck House & Gardens, and has been featured in several notable publications including The New York Times, Montclair Magazine, and Design NJ. Thanks to hard work and dedication, her business, Mierop Design, has evolved and grown organically over time, making Mierop a household name around town. 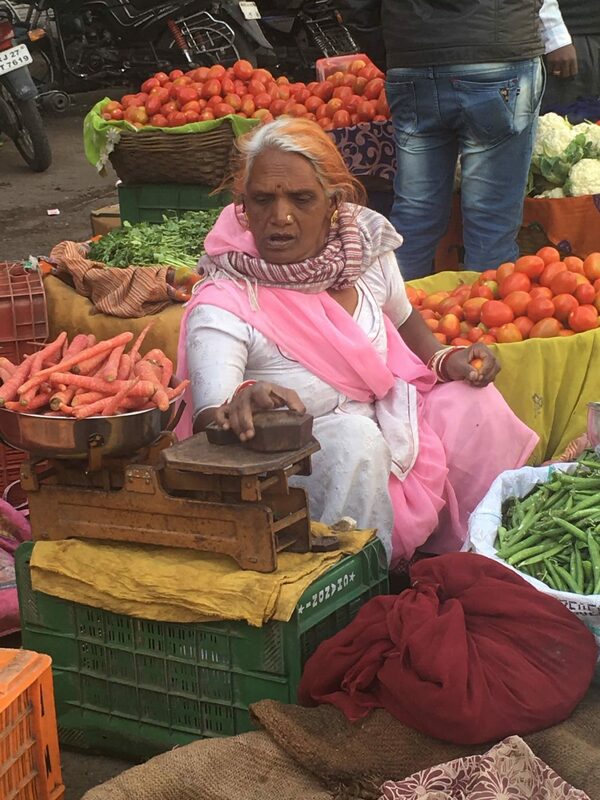 Read on to see how her journey unfolded. How did Mierop Design come to fruition? Many years ago, upon finding myself at home with a newborn and unable to get out and work in my garden, I entered an amateur design competition in Garden Design Magazine. 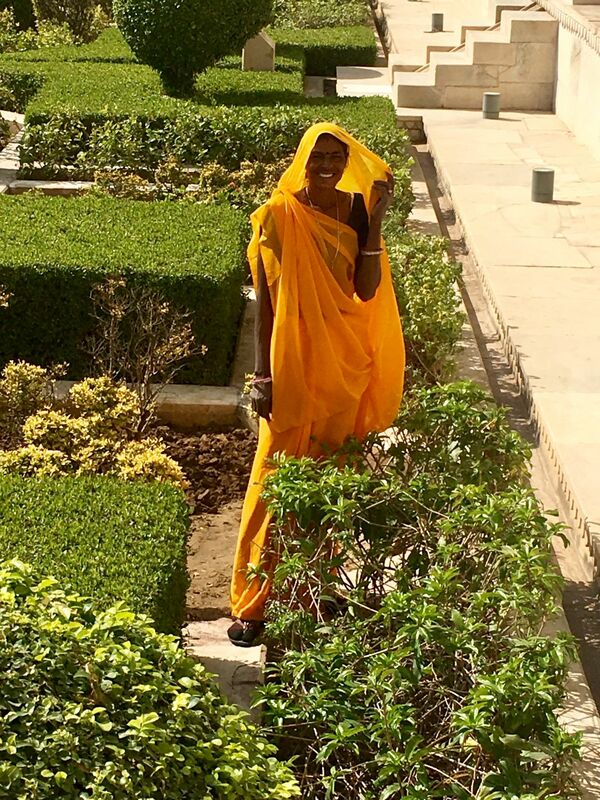 I submitted images of my home garden, a garden that I had worked on for many years. To my complete surprise, I was awarded the Grand Prize Golden Trowel Award, and had four pages of color press published in the fall of 1995. The press was picked up by additional publications at the time, the phone started to ring, and my business was spontaneously born. Being able to pick and choose the projects I want to engage with is very satisfying. I can tell if I am the right fit for a specific client or house, and I work to match my skills with what is called for by the homeowner or a certain property that speaks to me. The most challenging aspects of a project are always around scheduling. Weather delays often cause deadlines to be pushed out for reasons beyond our control. Unavailable or delayed materials can undo the best plans. Coordinating multiple subcontractors is always tricky too, so keeping a project moving economically is a dance in which the steps keep changing as you’re moving. I never set out to own my own business and I was quite nervous about creating one around my interest in gardening. I feared turning my passion into “work.” This business literally found me, but once in, I committed to doing it my way. This meant finding a path that was a bit unconventional, but one that proved successful because I brought my personal artistic style and hands-on gardening education to the table, as opposed to a more traditional construction /contractor background. 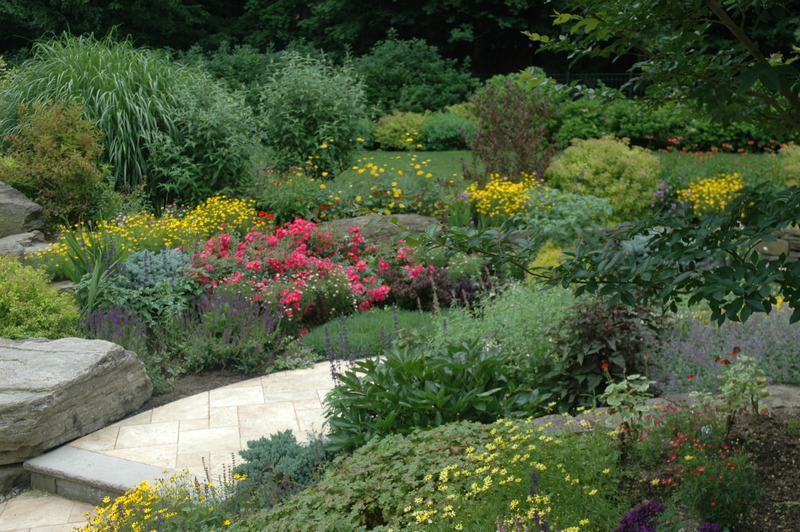 Many landscapers are contractors, not artists/designers, which is what differentiates my path from the rest. I have a strong sense of scale, texture, and space, and I really know what grows locally in Montclair soil because I spent so many years working in my own garden and learning from that. In the past, I did manual labor for my company—even as the artist behind the vision, it’s important to get your hands dirty and be a part of every aspect of the project. My outlook has changed because I learned that if you are good at what you do, and are willing to work hard at it, you can always find work and create income. I also believe that trust and integrity, almost more than talent, are key to successfully operating long-term with clients. My favorite days are planting days. This is the day, perhaps months after a project is initiated, that the plant truck shows up, the crew is ready, and that I, with plan in hand, start to set things up on the ground and see what has been in my head for all this time. I enjoy art directing those days and tweaking the original design so that everything feels just right in the end. Anyone can draw a pretty planting plan on paper, but it’s really getting into the dirt and seeing color and texture relationships in the field that allow a clear vision of what is and isn’t working. 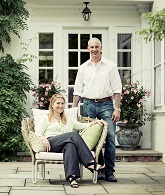 Right now what surprises me most is how seriously people are investing in outdoor living. I am of course very happy about this trend, but never expected to see it grow to this extent. 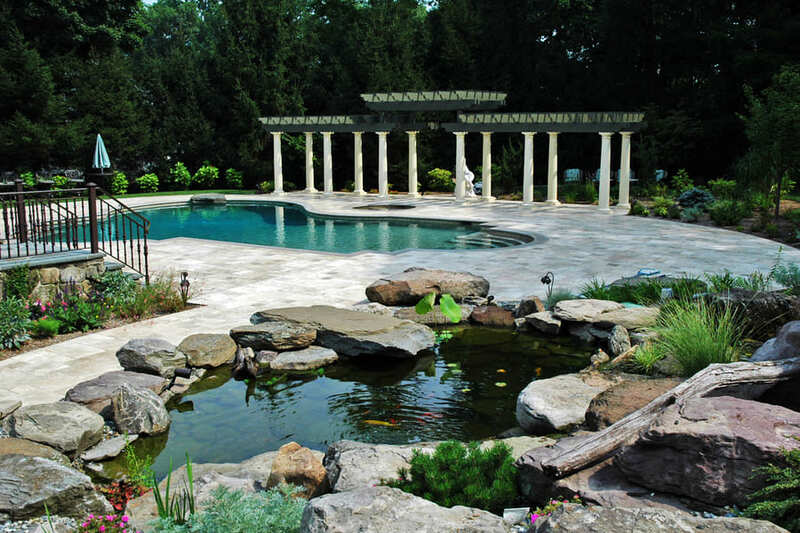 Many customers are building extensive outdoor kitchens and adding pools. 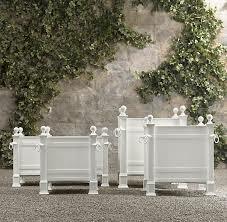 They are adding value to their properties and extending the year-round use of their outdoor spaces. Why is a beautiful landscape an enduring home investment? 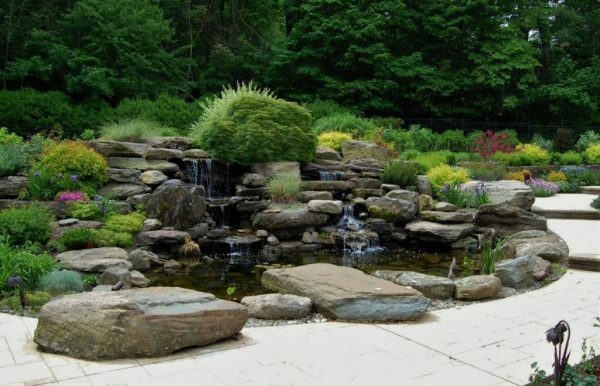 A beautiful landscape completes every home and adds to its resale value, both short-term and long-term. Mature gardens add distinct character to a property and today’s home buyers are happy to spend more to own a landscape that is both beautiful and functional for entertaining and relaxing for the whole family. 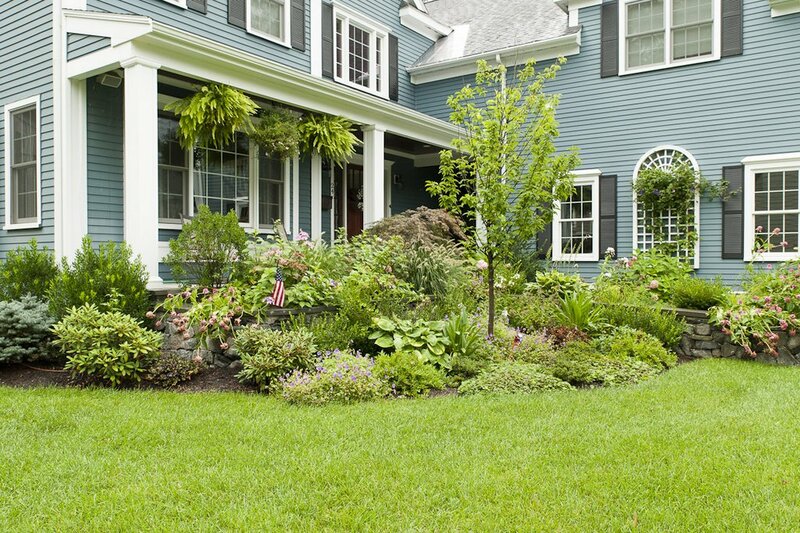 An unkempt, neglected, or overgrown landscape is a clear negative to home buyers. I often seen landscaped homes sell quickly, with comments about how the finished outside rooms were the “hook” that made the sale. 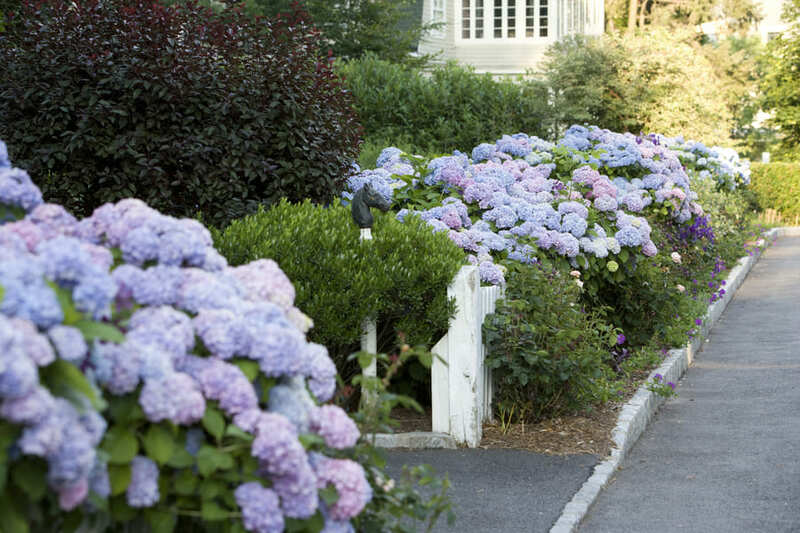 I am fairly traditional when it comes to flowers: Nantucket roses and hydrangeas. There are many perennials that I love too, especially catmint for its long flowering season. A good nap is my favorite way to decompress after a long day. Other than that, I am a pretty good binge TV fan. Lately, I am enjoying The Crown and Victoria; no surprise here that British sensibility, with its great garden culture, attracts my attention. I try to avoid politics if I want to stay calm. It’s important to invest in yourself as you grow. Don’t be afraid to spend on classes, reading materials, tools, equipment, or trips that educate or connect you to others in your field. I would also suggest moving slowly and not trying to grow or expand a business too quickly. There are so many variables, and things can change on a dime. It’s okay to move slowly. Everything doesn’t have to be “point and click.” Be courageous and trust the universe. And it sounds corny, but don’t be afraid to make mistakes. They can be a great way to learn and grow. Things will fall into place if you work hard, surround yourself with reliable people, and manage your expectations. I don’t have a motto that I live by! I have to remind myself every day not get overwhelmed, and that things have a way of working themselves out. It’s hard advice to really listen to when it’s high gardening season and everyone wants their work completed right away! But I do. Monrovia Growers highlights a Mierop Design project on May 18th. 916 likes! Thank you Monrovia for the call out! I love your plants so much! 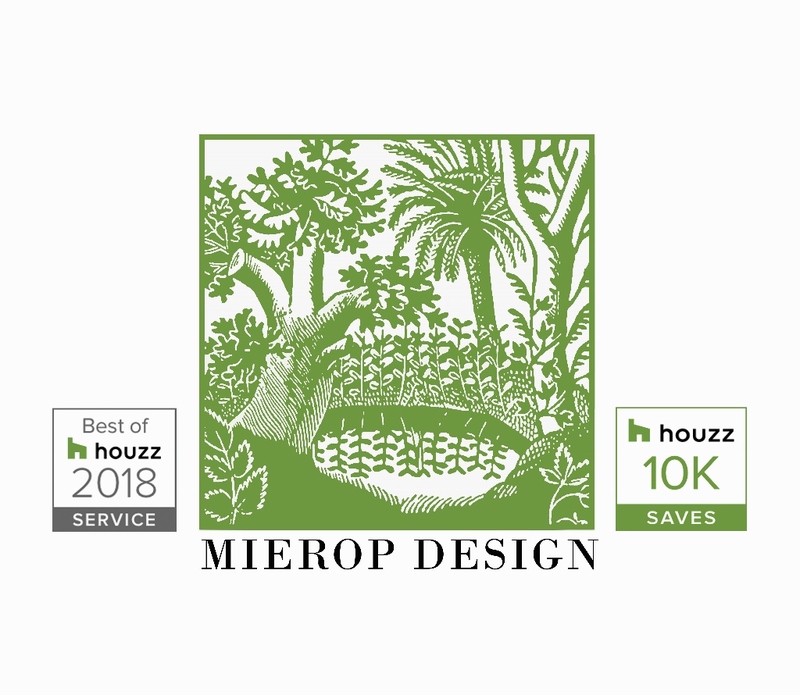 Mierop Design was awarded Best of Houzz 2018, making this the third consecutive year for this prestigious recognition. Mierop Design photos have been saved and shared over 10,000 times! Whoa! Even I am impressed by the volume of traffic that Houzz consistently commands for those seeking on-line design inspiration and resources for their homes and gardens. Winter 2018 opened with an unseasonably arctic January, and has continued to surprise with erratic weather bursts, alternating between windy, balmy, or the more recent damaging and wet snow. 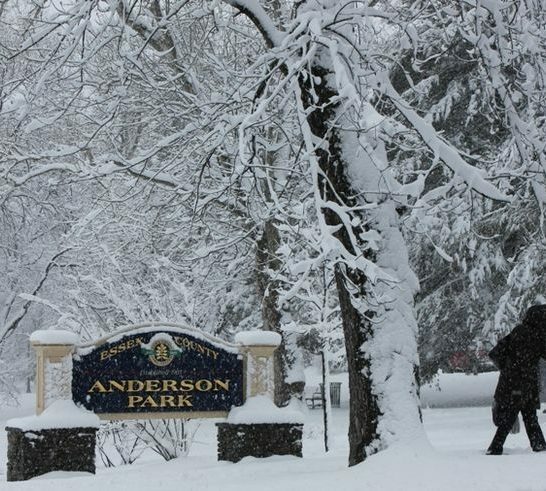 While Montclair was hard hit with damage to mid-size deciduous and evergreen trees, losses in nearby Maplewood and Short Hills were far more extensive. With so many trees and shrubs toppled, broken or bent beyond recognition. I expect to see many woody plants removed and replaced, with the remainders pruned to see how they fill out in time. In some case, branches that are bent may be tied together to train wood back into place. The lesson here is to understand the damage that can be caused by heavy, wet snow combined with rain. As precipitation accumulates during a long storm, maybe shifting between snow and freezing rain, wet accumulation on branches of woody plants freezes and becomes heavier. The best way to avert loss is to go out (repeatedly) during a storm to gently push snow off of branches before they bend or break. This is best down with a broom or the back side of a wide snow shovel. Climate change is undeniably wreaking havoc on our landscape investment although I remind myself that as upsetting as our local damage, we are by no means dealing with the destruction of a Houston or Puerto Rico – which is good to keep in perspective. Especially as we await this next, and hopefully final, winter snow storm!!! Fingers crossed that it passes with less of a reminder in our landscapes that it was ever here. 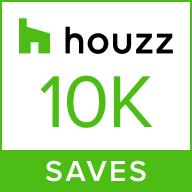 On a happier note, I was delighted to be awarded by Houzz with a Best of Houzz Service Award for the third consecutive year, as well as receiving recognition for 10,000 saves of my photographs to viewers’ Idea Books. Houzz is a beautifully edited on-line photo resource for homeowners seeking inspiration for their home improvement projects, both inside and out. If you are not familiar with Houzz, you will be delighted with the wonderful photography and articles presented, along with tips for finding professionals and plenty of shopping opportunities as well. It’s been a busy year for Mierop Design! 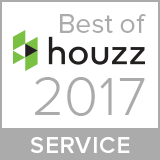 Months of spring rain dampened neither construction nor editorial attention, starting off with a 2017 Houzz Service recognition award for the second year in a row! Houzz, an innovative on-line resource (houzz.com) for both interior and exterior home improvement, is widely respected for its inspirational content, shopping and contractor referral services. 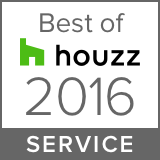 Only 5% of Houzz profiles receive award recognition, so it is a distinction to have been selected again by the editors at Houzz. The Association of Professional Landscape Designers (APLD) awarded its Silver Design Award to Mierop Design this summer for its competition entry, ‘A Grand Gesture’. Click here to read about the award winning entry. 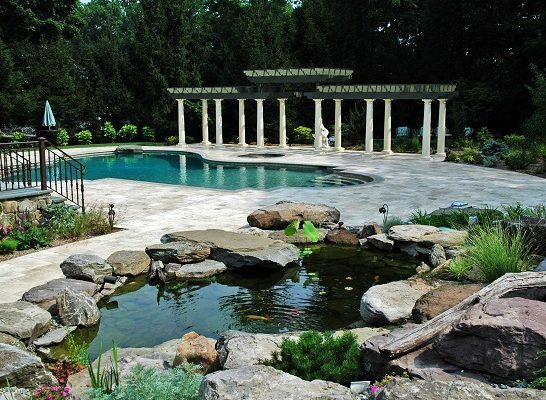 Featuring a resort style showplace garden, this magnificent project sets a massive koi pond, pool, pergola and stone terrace among extensive and showy plantings of vibrant color and textural contrasts. APLD is an international association dedicated to the pursuit and development of the practice of professional landscape design. Certified members may participate in the competition which yearly draws hundreds of entries from around the world. Mierop Design is honored to have been awarded this recognition for one of its most memorable and favorite projects! Thanks to The Scout Guide of Northern New Jersey, Mierop Design has twice in the last year been the subject of wonderful local coverage. First a personal interview with Lisa Mierop, and more recently, a feature entitled Turning Inside Out which highlights Mierop Design’s sister business, Pavillion Outdoor Furnishings. Furnishing the outdoor spaces designed and built by Mierop Design is the finishing touch to any landscape project, and has becomes an integral part of services offered. The Scout Guide is a nationally franchised publication, both in print and on-line, that is dedicated to searching out the best of local resources in 60+ cities throughout the country. 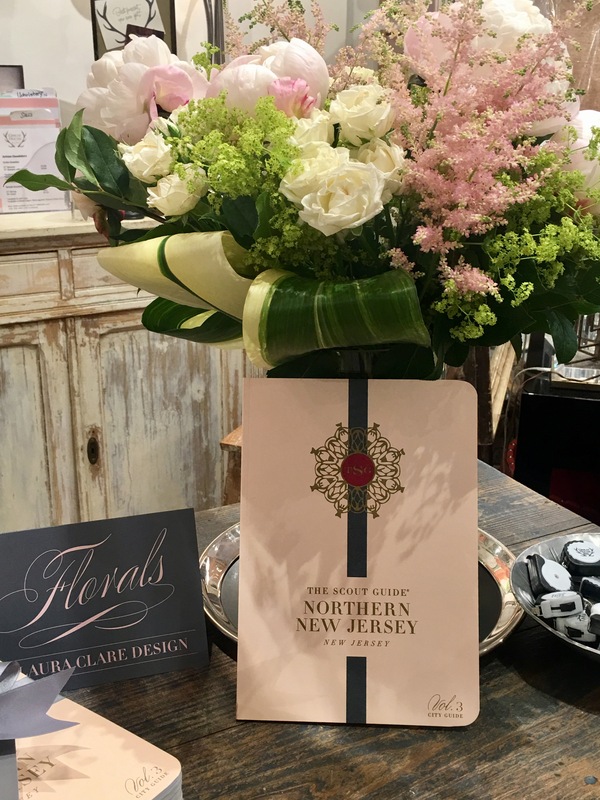 The Northern New Jersey edition is a locally focused selection of independently owned businesses, artists and entrepreneurs who are devoted to beautifying and enhancing life and its surroundings. The third edition of The Scout Guide of Northern New Jersey launched this June and is available at our shop, or online (northernnewjersey@thescoutguide.com). We are proud to have participated in three volumes of The Scout Guide of NNJ, and look forward to Volume IV in 2018! 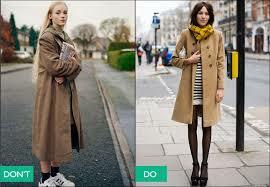 When I was a teenager, my favorite fashion articles featured ‘on the street’ photos of women dressed either very well or very badly – with big bold headlines telling you ‘do’ this and ‘don’t’ do that’! 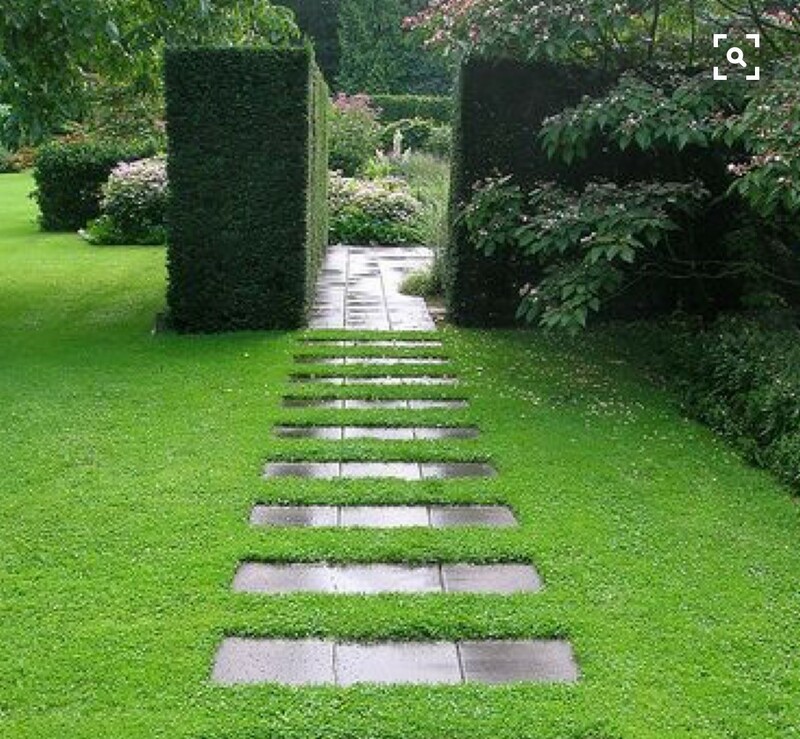 I’ve always thought it would be great to see something equivalent for landscape design, pointing out common errors made by homeowners and landscapers alike. I’m a big believer in learning from mistakes, and seeing them in photographs is like taking a speed course in better design. The proliferation of the deer population has changed the palette of what can be safely planted in any given area. Combining deer resistance with a need for a screening hedge or for plantings in a shaded spot can vastly limit choices. Deer will eat anything if starving, but it pays to avoid their favorite foods like arborvitae and yew. Don’t use these at all in deer populated areas, even though they have been the most classic standbys since forever. Substitute deer resistant varieties. A good list for our area is from Rutgers University. They rank plants in four groups from most to least resistant, and you can use the list based on your deer traffic. 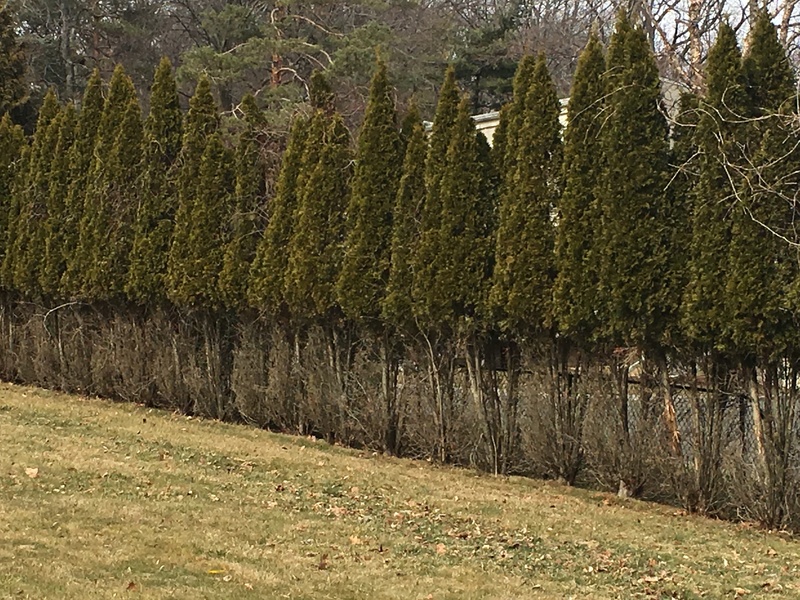 The most common request from clients is for a screening hedge to block views to neighboring properties and roads. Sadly though, many property lines where the hedge needs to be placed, are shaded by existing established trees. The reality is that tall evergreen plants don’t grow under big trees. A newly planted hedgerow may last a year or more but will fail over time between lack of light and root competition from larger surrounding trees. If the goal is evergreen screening, larger trees may need to be removed to make light available for new plantings. 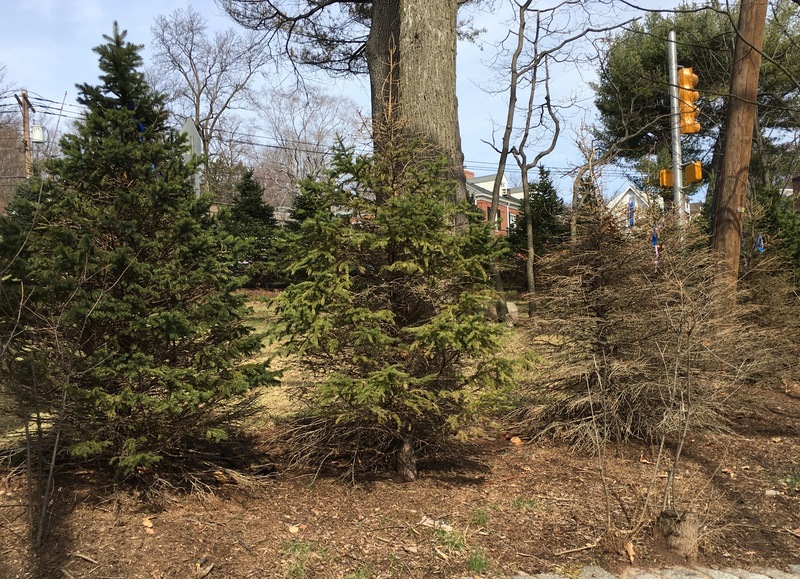 A looser combination of shrubs planted in and around existing trees may be another solution. A tree or other object that distracts the eye can be a device to minimize an unwanted view. And sometimes a fence is your best option. Plants, like people, come with all sorts of particular needs and preferences. There is wiggle room here and there, but respecting a plant’s particular cultural needs brings success. If you have a shady garden and love roses, don’t imagine they’re going to grow just because you love them so. This never pays off so it’s best to select plants that thrive in the conditions you have available: wet shade or sun, dry shade or sun being the most important factors. Plants also generally come small (that’s why they call it a nursery), but they grow! Read the tags before you buy and understand what the ‘mature’ size is before placing it in your garden. It’s hard, and sometime impossible, to move large shrubs and trees once they’ve settled in. It’s much easier to measure twice, and plant once. Gardens are fluid and take time to develop. Plants grow and change shape, albeit slowly. For the most part plants arrive as young specimens that need several seasons to mature to potential. In our ‘point and click’ culture, waiting doesn’t sell well. 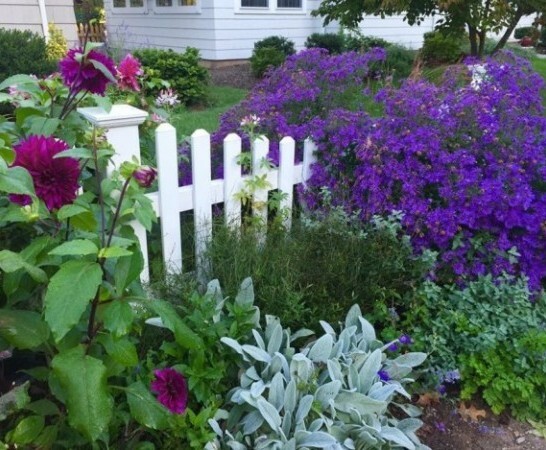 But the notion that more plantings will solve the problem makes for costly mistakes. Plants need ample space and air to allow for future growth. Planting closer together may take away unwanted gaps short term, but only creates headaches later when things are overcrowded and overgrown. Once a landscape is installed mulch is required to finish off the beds, retain moisture, maintain temperatures and aid erosion. 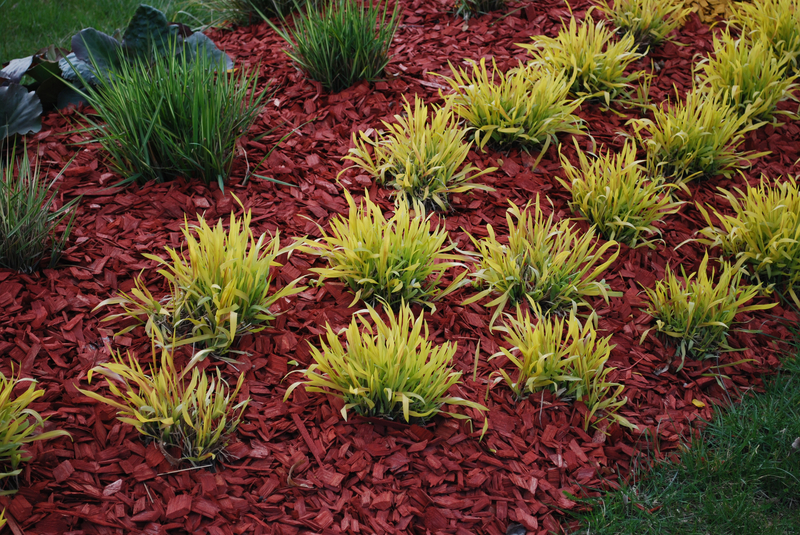 Mulch comes in many varieties with accordingly varied price tags. Sometimes I’ll get a request for black mulch because it looks rich or organic. But beware- black mulch is dyed to look that way, and therefore to be avoided. Similarly red mulch, my biggest ever landscape ‘no-no’, should never be used. It looks like bacon bits sprinkled into the landscape. Just plain ugly. Big buffet spreads are great for lunch, but a ‘little bit of everything’ doesn’t translate well into the landscape. As with any other great art, it comes down to editing. Don’t buy ‘one of each’ or dot plants into the landscape to try to fill gaps. Plant with purpose, intention and meaning. Groups of 3, 5 or 7 are recommended with larger swaths and masses making the biggest impact. As we are information overwhelmed everywhere else in our lives, use the landscape to reduce visual noise levels. Keep the message clear and avoid dotting in a little of everything. It always fails to please. Have you ever noticed trees that look like there is a small volcanic eruption at the base? This trend seems to be popular mostly in commercial applications, but I do see it around in residential settings. 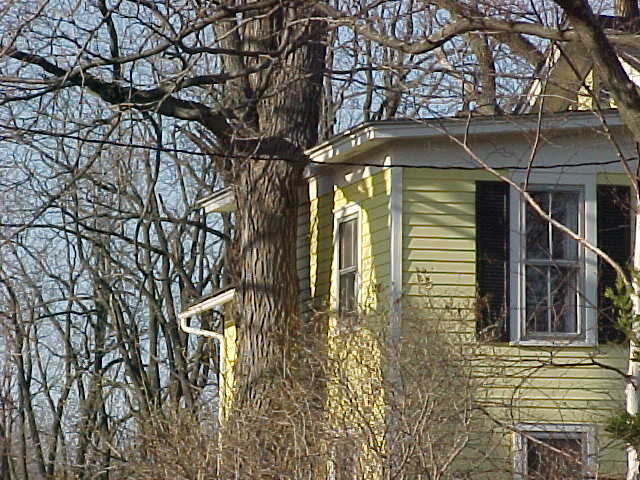 Trees can easily be set too low, or settle after planting and fail for this reason – suffocating the roots. ‘Plant them high so they never die’ is a good warning, but don’t go too far with that idea! And once planted at the proper depth, don’t drown them in mulch. It’s looks bad and it’s suffocating for tree root systems. And it’s double worse if you use dyed red mulch! Ouch on so many levels! Even though I was tempted to do a Grinchy repeat of my last year’s observations on ugly holiday decor, I’m going high and talking about plants, my favorite topic. 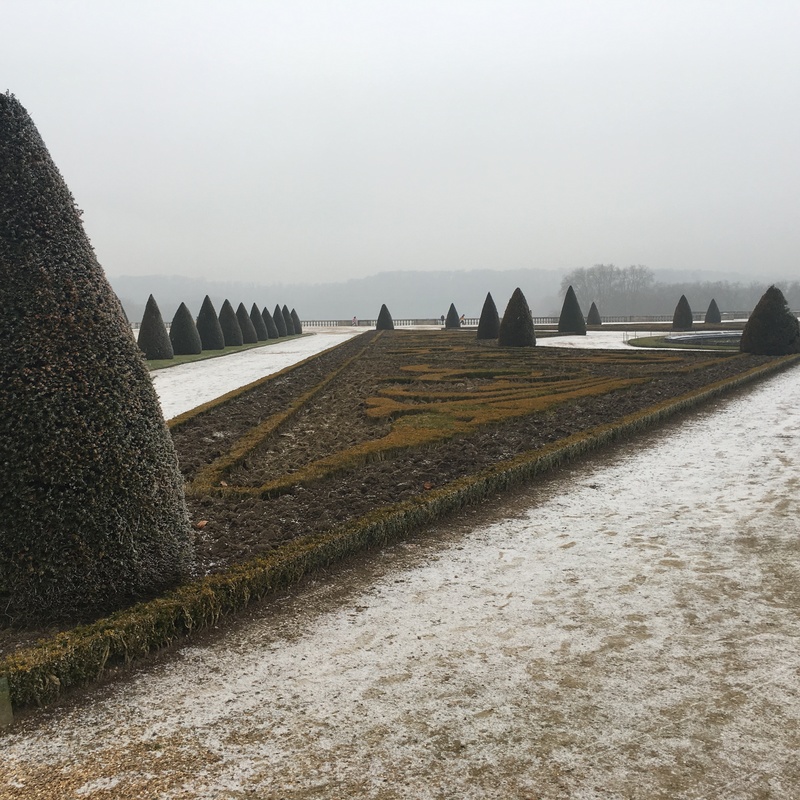 Winter can be challenging for the garden. No flowers, dead leaves, naked branches and soooo cold. 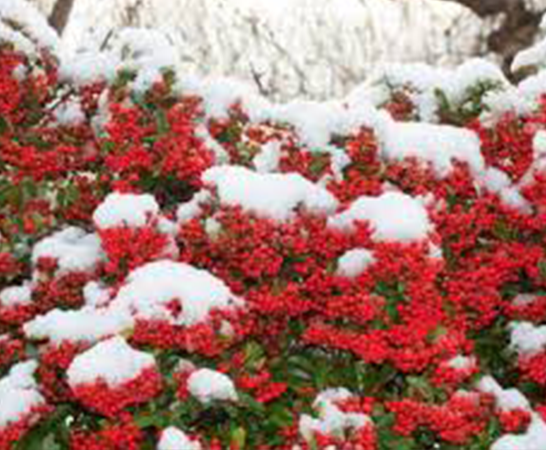 But, there are ways to make the winter garden interesting, and planting beautiful berried shrubs or trees is at the top of that list. 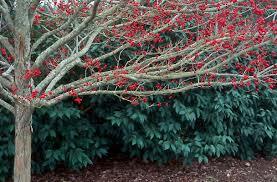 Ilex verticillata or winterberries are technically hollies, but they bear little resemblance to their prickly cousins. 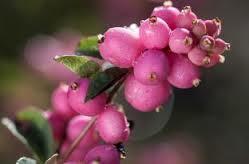 They are good looking, tall shrubs that are beloved for their profusion of red berries in winter. 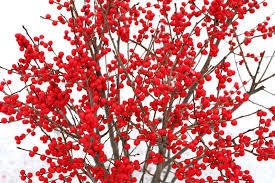 They are probably the showiest of all winter berry shrubs, and are especially magical when contrasted against the dazzling whites of a big snowfall. Nandina domestica, or heavenly bamboo, is one of my favorites. Not to be confused with real bamboo, they have an exotic, tropical feel that is lacy and delicate. They are heavily used in southern zones which is their normal habitat, but as our climate warms they have become more common here. 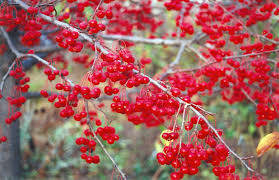 Some varieties, like Firepower, have foliage that turns bright red but in this case, no berries! Can’t have both! Nandinas only downside is that they can defoliate in bad winters, but they do generally recover very well and are worth considering. 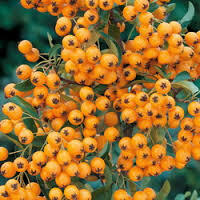 Pyracantha varieties, firethorns, are not the most attractive of shrubs having a somewhat floppy awkward form with indistinct leaves. However, when sited flat against a wall as climbing vine, they show their superpowers and are spectacular for a late show of red, orange or yellow berries. 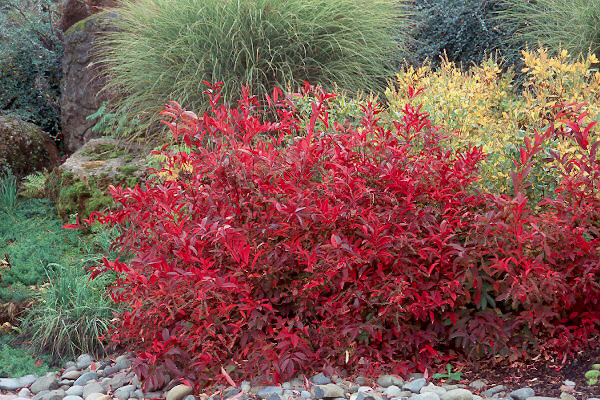 Especially if placed against a light colored wall or background, firethorns can brighten the fall/winter landscape with unexpected color. Beware – they do actually have thorns, but nothing your average gardener can’t handle. The name says it all. A little used medium size tree, Winter King hawthorns (which like pyracanthas do have thorns) are standouts in the winter landscape. 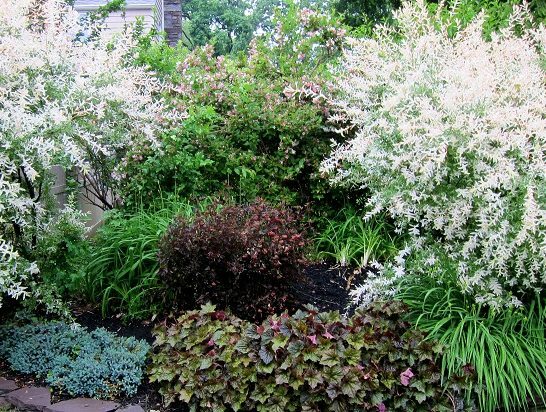 They offer a lovely spring show of delicate white flowers and have interesting silvery, exfoliating bark to boot. Years ago I planted an allee of them all along the road bordering an Essex Fells property, and it has stood the test of time. Four season interest keeps this tree variety at the top of my list for exceptional specimens. Applied to the out of doors, climate control is an oxymoron. We expect to be able to manipulate temperature and humidity in our homes and cars, but have no control over what happens outside of these bubbles we inhabit. Controlling Mother Nature was never reality, however, as the years unfold, there is less pattern and predictability to weather, and more harsh events that leave damage and destruction in their wake. 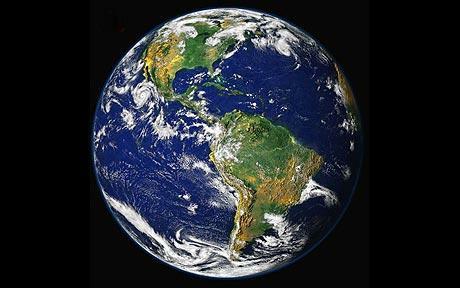 In our corner of the Northeast, we have been relatively fortunate (so far) not to have suffered the catastrophic flooding, wind, drought, fires and landslides seen in other parts of the US and globe. Things, however, are not what they used to be, even compared to five years ago. 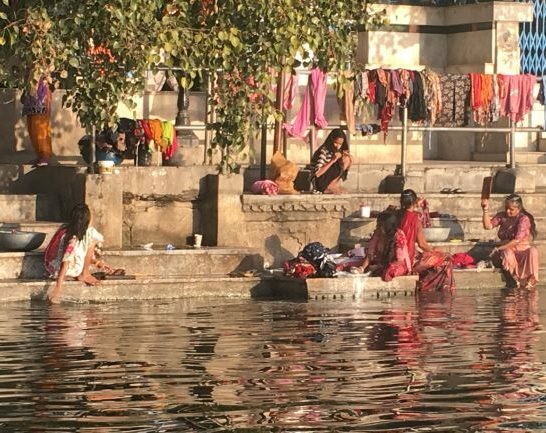 Regardless of your position on climate change, each year new records are set for high temperatures, and despite the copious rain of late, this summer was defined by weeks of drought in addition to scorching temperatures. As an individual with global climate awareness, who also happens to be a gardener, I spend a lot of time witnessing (and worrying about) changes I observe in my work, and their effects on plant life and local landscapes. I was raised on the organic paradigm in which the complex and holistic interrelationships of all life forms are respected. Plants such as rhododendrons that thrived twenty years ago now often struggle due to weather extremes. 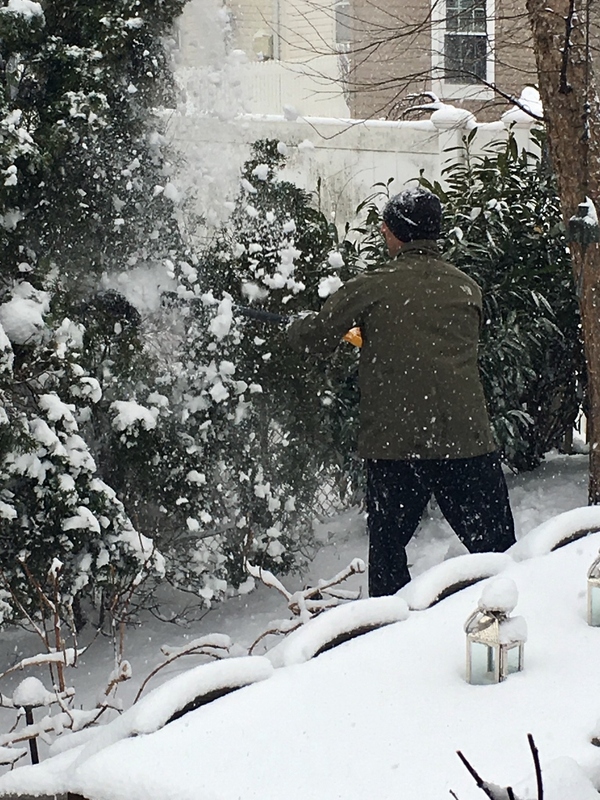 Other plants such as crepe myrtle or southern magnolias, once avoided due to marginal hardiness in northern New Jersey, have become everyday selections. As with many things in life where Nature is in charge we have far less control than we want. What is new is that the patterns that held the unpredictable within understood boundaries are literally melting. The ‘general rules’ have been thrown out and parameters that once defined New Jersey ‘normal’ are gone. There isn’t even a ‘new’ normal. So what to do? Aside from supporting local and international climate organizations and their political efforts, we must plan for a future that is different than the past, while accepting that change is our only constant. 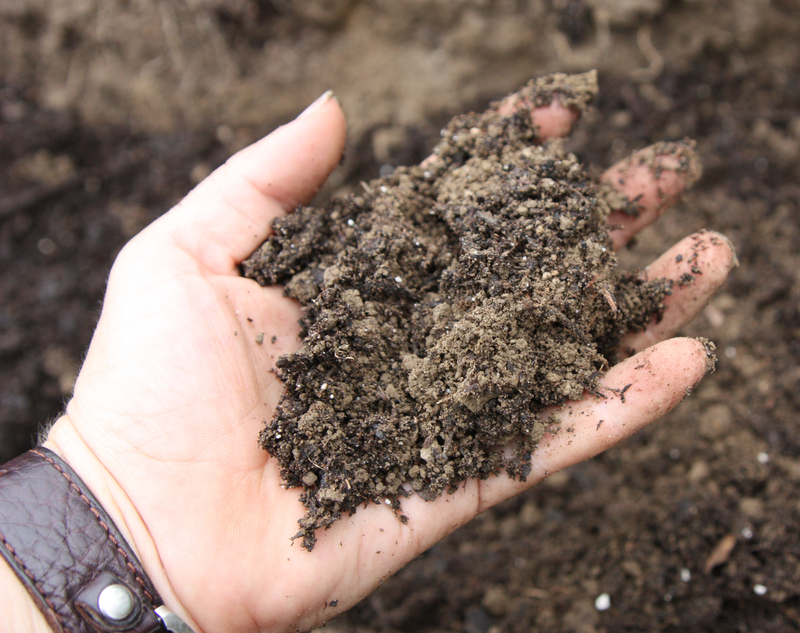 The more effort spent to prepare soil deeply with plenty of organic amendments, the more you will find plants thriving by absorbing available moisture and nutrients. It’s a lot like battling the flu by being well nourished and rested. The stronger the immune responses are, the better the resistance to infections and illness…the same goes for plants. The stronger their environment below the soil line, the better they can survive extremes of temperatures or precipitation. 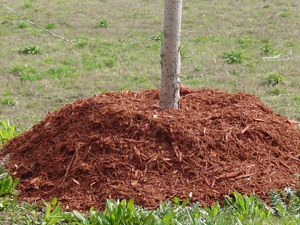 Mulching regularly ensures that the soil continues to be protected. 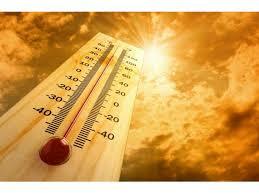 Mulch insulates soil from heat and cold by maintaining even soil temperatures. It retains moisture within the soil reducing water requirements, especially important during droughts. Finally mulch breaks down into organic components that continue to feed soil and plants. Stop using chemicals unless absolutely necessary. Lawns are the most needy in terms of their chemical needs and many lawn care companies are offering ‘organically based’ programs now that minimize the use of chemicals. 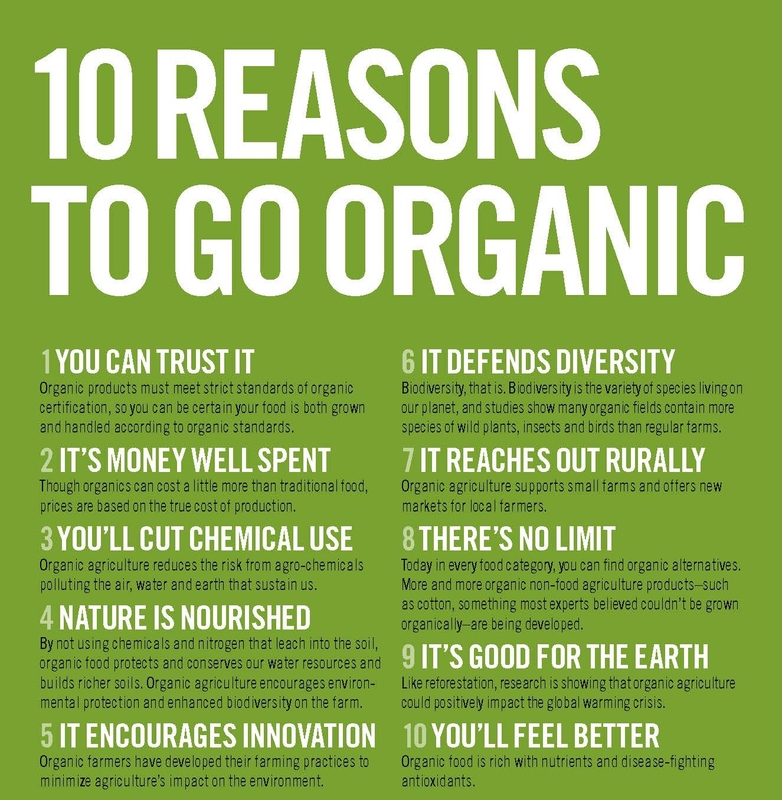 (See blog post from May 2016) In tree and shrub areas, organic fertilizers can be used to fertilize plantings. Make your garden weed-less the ‘old fashioned way’- pull the weeds by hand!! 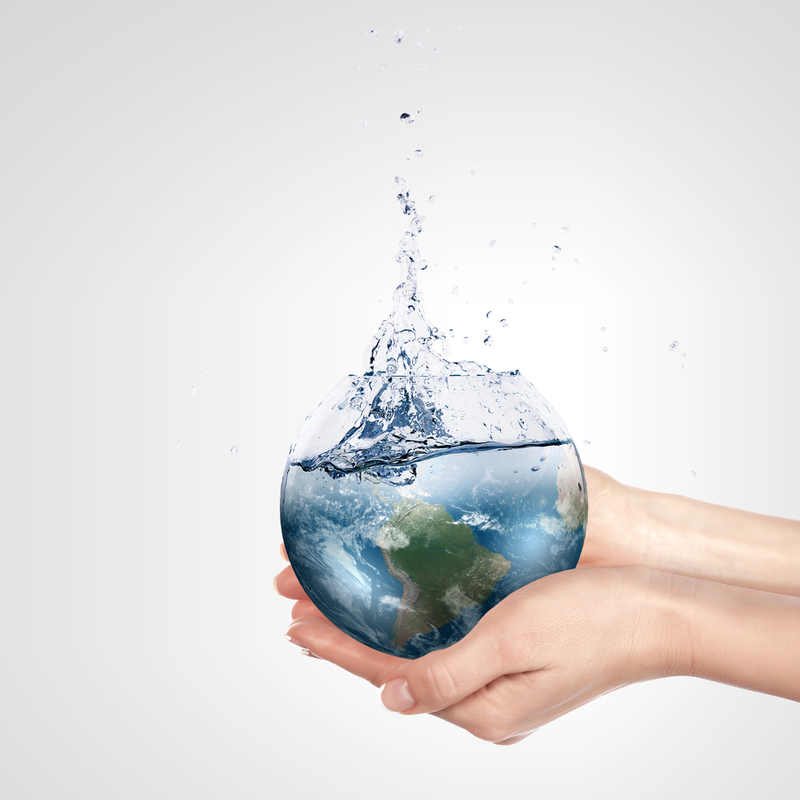 It takes time, but it’s better for the planet to stop using chemical controls. As temperatures climb and water becomes an ever more precious resource, consider plants that have lower watering needs. Especially in full sun where I am seeing plants crisp and burn under otherwise normal circumstances, try substituting plants that thrive in these conditions. 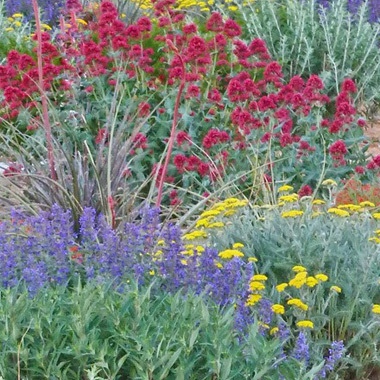 Mediterranean plants that are accustomed to unrelenting sunlight can work here, as can some desert species. Some perennials that historically thrived in full sun may do better moving to part sun/part shade locations. Situating plants properly will be important going forward as we adjust to their changing ability to perform. Use water sparingly. This trains plants to seek for water, not expect it. Many automatic systems are set for run times that are too long and/or frequent. A rain sensor is important to shut the system off after precipitation, but it does not take you ‘off duty’ in terms of monitoring things overall. Experiment with your contractor to find the sweet spot between plants thriving and minimal runs/frequencies. For shady zones, run the system less often and for shorter times than in the sunny spots. The deeper plants have to source for water, the stronger and longer their root systems become. After heavy soaking rains, consider turning your system off completely for up to five days. Just remember to turn it back on!! Aside from making shade that offers a cooling respite, planting trees (or any plants for that matter) increases the air’s ability to absorb carbon dioxide and release oxygen. Globally, vast parts of existing forests and treed areas are being destroyed, forever altering the planet’s delicate eco-system. If you google ‘what can I do about climage change’….planting trees is one action step suggested. Being in the autumn of my own life makes me partial to fall garden performers. Late to the party, they are a sweet reminder that great things can occur at any moment in the continuum of time. In fact, one could argue that the waiting makes them sweeter. 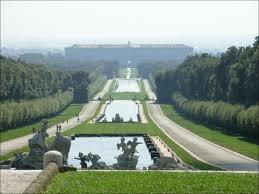 As the gardening season rapidly draws to a close so does our expectation and anticipation of the new. Late bloomers are all the more gratifying for their strong show as the rest of the garden is fading away. Aided by lower temperatures and light levels, their vibrant colors pop against the backdrop of fall’s otherwise yellowing foliage. 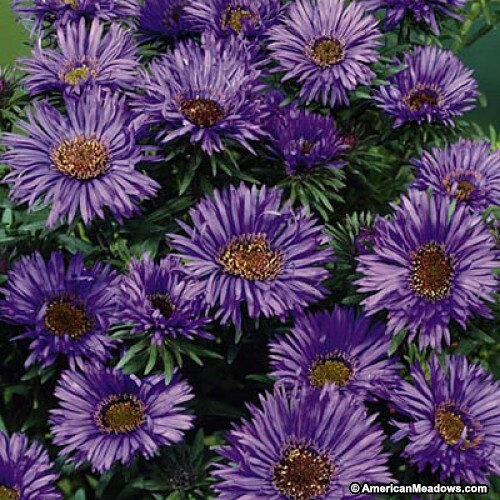 With daisy like flowers, fall asters come in a very wide range of heights and colors and are well known for their spectacular fall show. I prefer the shorter, stockier varieties that require no staking. Encourage an even more prolific flower show by pinching asters earlier in the season. 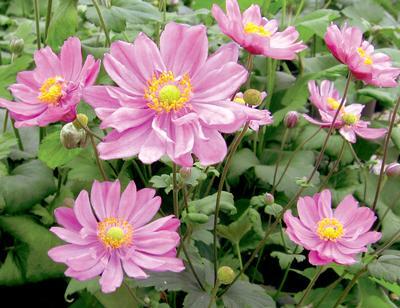 Great for part sun and easy naturalizing, anemones come in single and double forms and make excellent cut flowers. They are at once elegant, graceful and a little bit wild. Grasses are peaking by the fall. Slow to start in spring, they hold off until late summer to make their showy plumes which, if left uncut, make great winter catch-alls for snow. 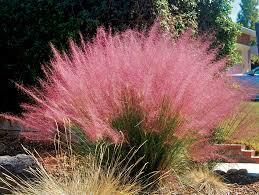 My all time favorite is Pink Muhly Grass with its pink cotton candy-like inflorescences, but there are so many from which to choose. Most grasses prefer full sun but you’ll find some great selections, like hakonechloa macro Aureola, for shadier areas. Nandina (heavenly bamboo) ranks high on my list for its unique exotic foliage and showy fall into winter performance. 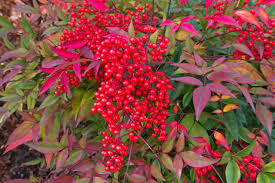 Nandina domestica has brilliant red berries, and the cultivar Firepower has vibrant red fall foliage. 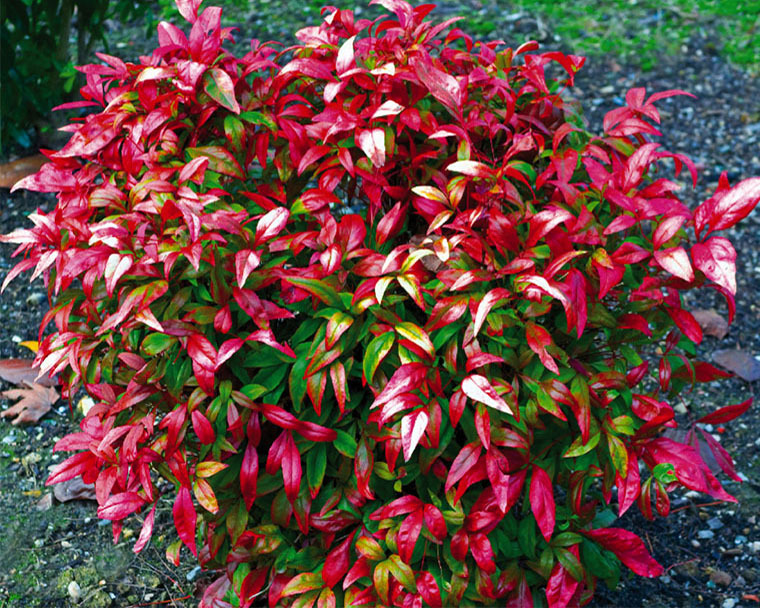 Nandina performs best in full sun but is quite tolerant of part sun and part shade situations. Great fall foliage for this native shrub adds to its earlier season merits. A great naturalizer for part sun areas that also works well to control erosion. The name of cultivars Merlot tells you everything you need to know about its fall color show.